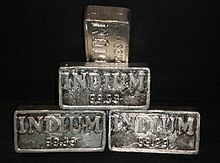 Indium sī 1 ê hoà-ha̍k goân-sò͘. I ê goân-chú-hoan sī 49, hoà-ha̍k hû-hō sī In. Indium chit-ê miâ sī tùi indigo hō--lâi, ì-sù sī chi̍t khoán chúi-tēng-sek, iû-lâi sī i-ê hun-kng sek-lia̍t (spectrum) lāi-bīn nâ-sek ê sûn. ↑ Guloy, A. M.; Corbett, J. D. (1996). "Synthesis, Structure, and Bonding of Two Lanthanum Indium Germanides with Novel Structures and Properties". Inorganic Chemistry. 35 (9): 2616–22. doi:10.1021/ic951378e. Chit ia̍h siāng bóe tī 2018-nî 9-goe̍h 18-ji̍t (Pài-jī), 12:31 ū pian-chi̍p--koè.